I’ve always wanted to be the kind of person who can wander through the grocery or farmers market and spontaneously plan a meal based on what looks good. But I’m not. I’m more the kind of person who, if she doesn’t have a carefully crafted list in hand, will come home with a random assortment of lovely-looking stuff, none of which has any business being on the same plate. So while ordinarily I try to have at least a general idea of what I might like to make before coming into close contact with vegetables, it doesn’t always work out that way. Like on my last trip to the farmers market, for example. I was accompanied by my mom, who doesn’t particularly enjoy cooking or even eating, but who really likes buying things. She’s also the kind of person who keeps four bottles of ketchup on hand. Just in case. So it should really come as no surprise to anyone that our unsupervised visit to the farmers market yielded thirteen ears of corn, a pound of eggplant, two pints of cherry tomatoes, a pound of zucchini, two pounds of squash, five large onions, several peppers, and two pounds of potatoes. Oh, and no plan. Fortunately, my family was visiting. Because A) as crafty as I may be, there’s no way in hell I could trick Chris into eating that many vegetables and B) these grilled vegetable kabobs have been a summertime staple at my house ever since one of us clipped the recipe out of some now-forgotten magazine years ago. 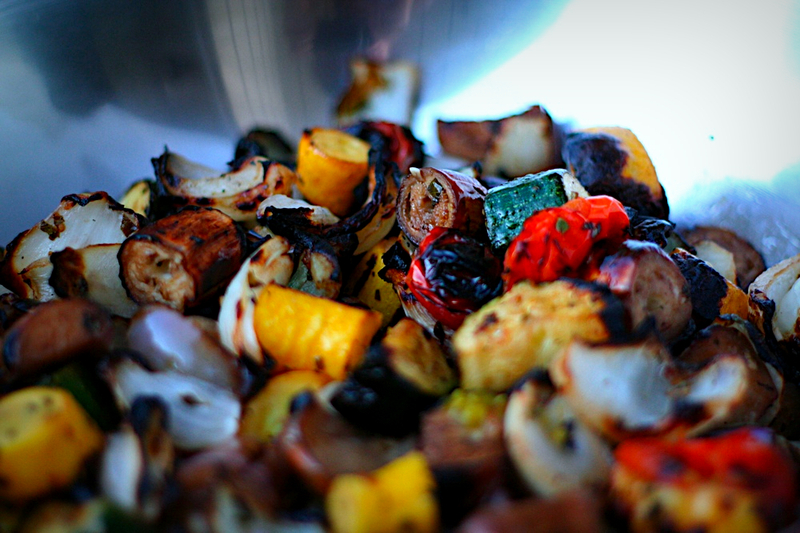 Although the balsamic marinade gives the vegetables a delicious sweet-tanginess and the grill imparts the perfect amount of charred smokiness, I suspect our affinity for these kabobs lies in the fact that you can do all your chopping in the morning, head to the beach for the rest of the day, come home after sunset and have dinner on the table before anyone’s even finished their first cocktail. Plus did I mention they’re exceedingly yummy? Like summer on a stick. 1) Cut the vegetables into bite-size pieces or leave them whole, depending on their shape. (For example, you’d want to chop up zucchini but not so much the cherry tomatoes.) Place them in a large bowl. 2) Whisk together the remaining ingredients, pour the marinade over the vegetables and stir to coat. Refrigerate. 3) Sit on the beach and have a few beers, allowing the vegetables to marinate for several hours (anywhere from 1 to 24 hours of marinating will do). 4) Thread the vegetables onto bamboo or metal skewers. If you’re using bamboo skewers, it’s a good idea to soak them in water for at least 30 minutes so they don’t catch on fire when you put them on the grill. 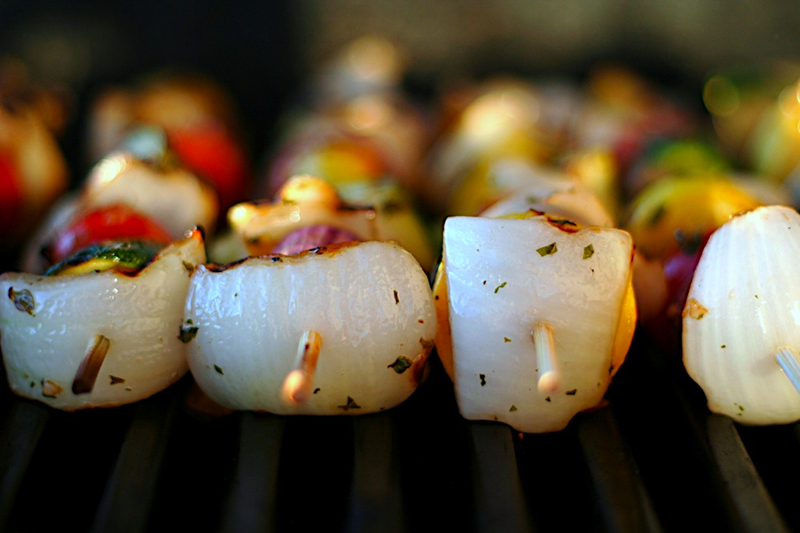 5) Grill the kabobs over medium heat for about 8-10 minutes, turning once. This entry was posted on August 13, 2008 by Megan @ When Harry Met Salad. 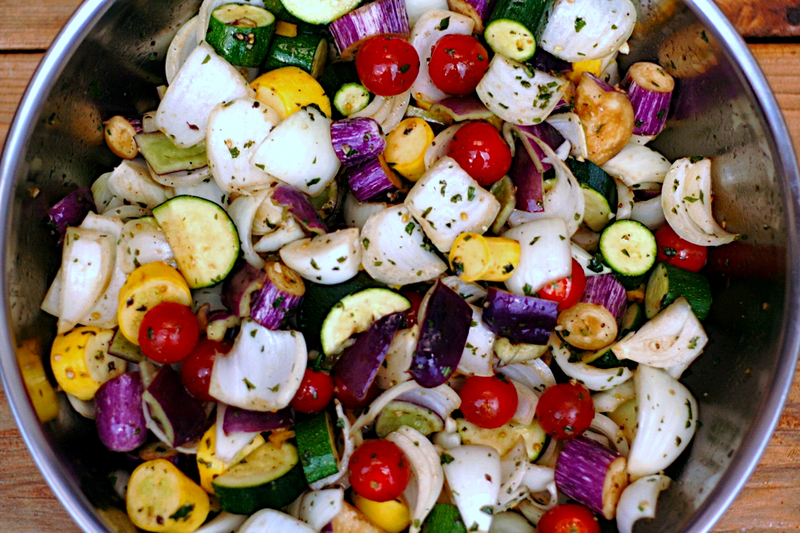 It was filed under fruits & vegetables and was tagged with eggplant, grilled vegetables, grilling, kabobs, onions, peppers, squash, tomatoes, vegetarian, zucchini. …and now I’m hungry. This looks great. Can you grill potatoes on the kebabs too? I’ve never had much luck grilling potatoes – they tend to fall apart, especially if you try to skewer them. I think if you could grill potatoes in a grill basket or grill pan though, as long as your parboiled them for a bit first so they’d cook through before completely charring on the outside. We just roasted ours in the oven with some olive oil and salt & pepper. I’ll give these a try after we get moved and get a grill. I’m all for substitutions and modifications! I made this last night. The marinade turned out very well, even though I forgot the chopped tomatoes. I love the sweet flavor. I made kebabs with cippoline onions, pear tomatoes, eggplant, and some cute brown peppers I got at the market, and they were fantastic despite my rudimentary grilling skills. Tony – Thanks for the visit and the tip. Grilling is my absolute favorite thing to do with corn. Mark Bittman is also a big fan. Clare – Sounds lovely, and I’m glad you liked it! This is the perfect solution for my dilemma – I am going out of town tomorrow – and I went nuts at the farmers market on Sunday. 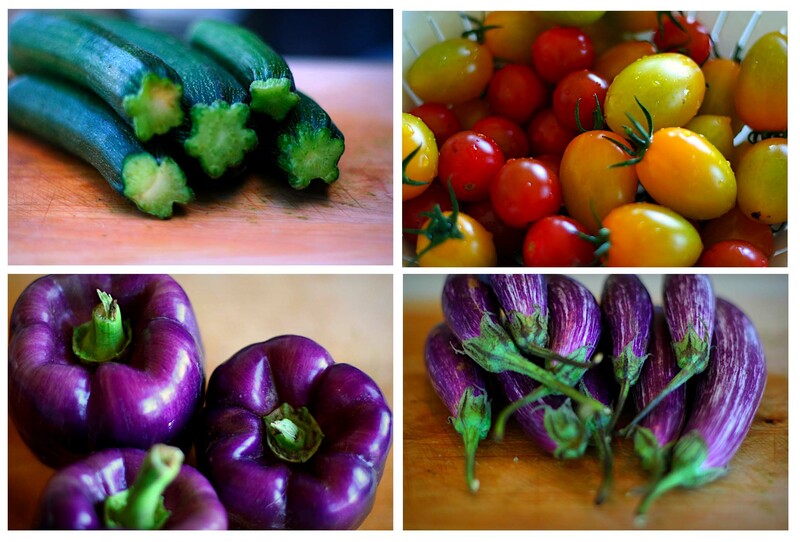 I can’t resist the beautiful tiny eggplants or heirloom tomatoes or gorgeous squash. So I have refrigerator full, an entire day of packing/cleaning and don’t want a huge mess in the kitchen. Perfect simple and delicious sounding recipe. I am looking forward to exploring your blog. Wish I had time for the beach today. 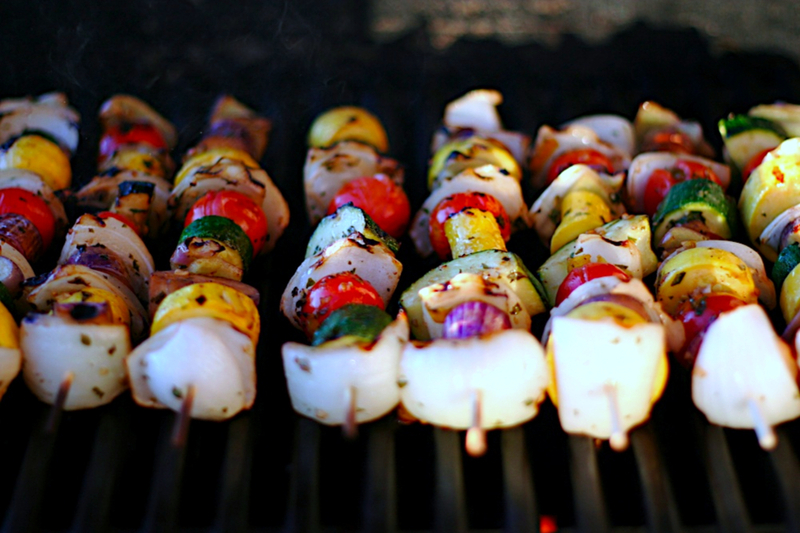 Pingback: Meatless Monday: Memorial Day Grilling Ideas « This & That – An outlet for all things related to food, design, our environment and more. Im interested in getting permission to use the photo vegetable quartet. It is an image of zucchini, cherry tomatoes, purple peppers and purple eggplant. Do you have any information on if this would be possible? Thanks for posting this recipe! I want to try it for the 4th of July this week. Technical question: Is the 1/4 cup of chopped tomato in this recipe a part of the marinade? …and do you think I can substitute the maple syrup for honey? Thanks! Yes, the chopped tomato is part of the marinade. And I think honey would be lovely. Enjoy! I am going to try this soon as part of my heathier me!! Yes, you can do potatoes, just use fingerlings or tiny red ones, our farmer’s Markets are carrying both right now (July in WI)….yummmm. Trouble with using large ones cut up is as you said, they tend to fall apart. after this type of passion. of fresh clothes and a servant to clean up for you.